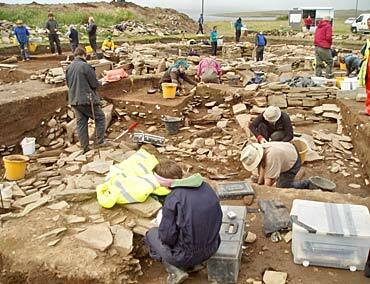 It is wonderful to see the expression on visitors’ faces when you explain that the folk of the Late Neolithic, who built the Ness complex, delighted in colour — on the pottery, their walls and probably on themselves. Colour is such an integral part of our own lives that we take it for granted. 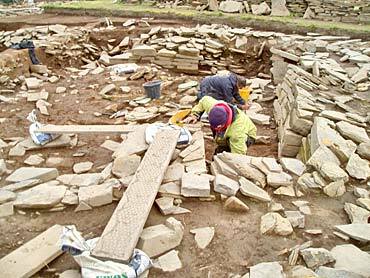 With a palette of colours limited by the materials which could be exploited then, colour was probably even more important and vibrant in the Neolithic than we can imagine. Heads down in Structure Twelve as Dave and team get to grips with the primary infill deposits. Today, another “painted” stone turned up. Andre found, face down within rubble, while digging just outside Structure One. It is a very distinctive red and, in year’s past, we would have had to remove it carefully, parcel it up and send it south for analysis. Scott obtains a reading of the chemical components of whatever material he is targeting. This is then processed, through a programme on his laptop, to give a reading of the chemical elements present. Scott could tell instantly that the red material is composed almost entirely of iron, which is almost certainly haematite, an iron ore found in Orkney. He also confirmed that the colour had been applied to the surface. Although this is the result we would have hope for, it is tremendous to have it confirmed, and so quickly. From the ashy deposits in the area of the robber cut in Structure Fourteen came a cache of burnt flint and a quartzite flake which appears to have been polished and which may have been a tool used to polish stone axes. More on this next week. Work on Structure Fourteen is progressing quickly and it now appears possible that the full anticipated plan of the structure will become clear soon, and make sense. Andi doing a photo shoot for the UHI photographer Tim in Structure One. Over the last couple of days, as if we didn’t have enough photographers on site, we were also joined by Tim, who has been commissioned by the UHI to capture some images for their website and promotional leaflets. Some great shots were taken and will no doubt attract even more students to study archaeology in this archaeological Mecca! Dave is still dealing with the complexities and frustrations of the central midden, but more wall lines are beginning to emerge. There is a possibility, however, that they will not align with Structure Eight which, if proved, will create more headaches. Are they the remnants of yet more earlier structures under Structure Eight or yet more idiosyncrasies relating to Structure Eight itself? In Structure Ten, Mark is investigating part of the south-west stone buttress to see if the original wall lies behind, while the robber cut that had removed much of the internal wall face is being chased in the north-eastern corner. In Structure Twelve, Dave’s problems continue with a hint — just a hint — that there is a blocked up entrance to the structure on the north-west corner. More on that to come. We’ll close now. After all, it’s Friday. All go in the central midden area in the south end of Structure Eight. My name is Jon Rhoderick. I am part of the Willamette University team on site this season and, like many others here, this is my first experience in the archaeological field. I chose this course as my last college class and had no idea what to expect. I come from an anthropological background, but none of my studies revolved around ancient societies so I saw this site as an ideal place to get a hands-on experience that I yearned for many hours in the Willamette Library. 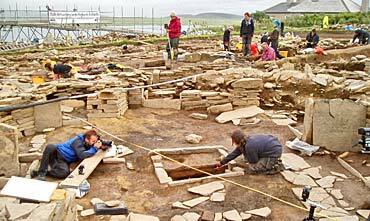 We started off the course with a trip to Skara Brae, but even that didn’t prepare me for the size of the excavation at Ness of Brodgar. When I started I had almost no idea what I was doing, but the supervisors have done an excellent job of slowly incorporating more skills we could use on site. I’ve spent my entire three weeks, so far, in the central midden area between Structures Eight, Ten, Elven and Twelve. 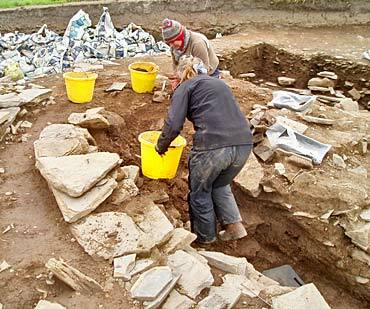 Jan and Claire reveal more of the robber cut of the north-western corner of Structure Ten. Originally, I thought that the first-year excavators were being placed outside of the structures and into this area because it was relatively hard to make mistakes but, as we excavated layer by layer, we started finding large fragments of pottery that suggested we were digging was not just an ancient rubbish heap but a place where regular daily activities were occurring. It’s exciting to learn more each week and gain more responsibilities. Last week, I had plenty of trouble removing even small pottery shards but early this week I was lucky to extract a piece larger than my hand in one cohesive piece. Unfortunately for me, I could only view the interior of the pot, but I am quite sure that whoever cleans the exterior portion will see artwork and patterns that haven’t seen light in thousands of years. The next day I helped Nick extract an impressive pot that was almost entirely intact. It’s difficult to explain the tension that you feel when removing a delicate pot that you and your friends have worked on for two weeks, but it’s certainly easier if the pot is completely bandaged like a mummy so you can’t see any more cracks appear! Usually my time off has been taken up by watching the Olympics and sleeping, but this weekend I have a unique opportunity for my main passion in life — rock climbing. I’ve found a climbing partner who wants to climb the Old Man of Hoy, one of the most famous sea stacks in Britain and the most iconic climb of the Orkney Islands. We’ve already decided I’m leading the hardest pitch, which makes me a bit nervous but, just like excavating here at the Ness of Brodgar, the Old Man of Hoy is a once in a lifetime experience and I can’t wait to get after it.